When I first read the script for The Social Network, I was completely blown away. It was the first time that I had ever really taken a look at screenwriter Aaron Sorkin’s work. The fact that I had read what is considered Sorkin’s best work to date as the first thing I’ve read of his sets the bar high. Very high, seeing as how obsessed I am with The Social Network. (I’m still sore about losing that Best Picture Oscar.) From that point, I decided to focus on what Sorkin will work on next. (His old show, The West Wing, and previous films hadn’t interested me then, so I figured to just leave them in the past.) He did a great job on the Moneyball script, but what I was really waiting for was his new show, The Newsroom. As a kid, the news was everything in my household. For a long time, I aspired to be a news reporter. As you can see, I’m going into a slightly different direction. Nonetheless, I still find it to be a fascinating career, and I couldn’t wait to see what The Newsroom would bring to the small screen. After catching an early premiere of the first episode, this show is a phenomenal and enthralling piece of television. 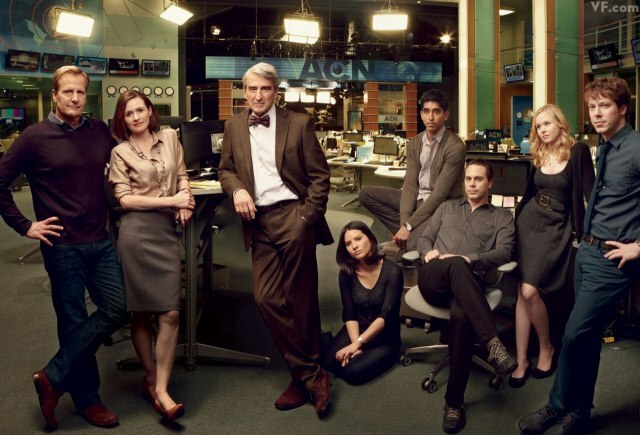 With an excellent cast and script, The Newsroom premieres with the best pilot episode I’ve seen… ever. The show is centered on cable news anchor, Will McAvoy, played by Jeff Daniels. McAvoy has been considered “the Jay Leno” of news reporters. He’s sarcastic, jokes around, never takes sides and/or pushes for information. So during a discussion at Northwestern University when McAvoy is pushed to answer why he thinks America is the best country in the world, he blows-up, shocking audiences around the country and world. Three weeks after the blow-up, he returns to work to find his executive producer and staff gone. He learns that they left him to work for another news anchor who’s taking over the timeslot after him. He’s further dismayed when his boss, Charlie Skinner (hilariously played by Sam Waterston) tells him that he has hired Mackenzie MacHale (Emily Mortimer) to be his new executive producer. It’s instantly obvious that there some kind of bad (and possibly romantic) history between McAvoy and MacHale. Despite personal conflicts, the news still needs to be reported. Together with his newsroom staff and MacHale, they set out on a mission to do the news well. I feel like Sorkin can make the dullest things exhilarating. Not that I think the news is dull, but he does have a gift making almost anything seem incredibly fascinating. From right at the beginning of The Newsroom, I was hooked. The writing totally pulls you in. McAvoy is an interesting character. The show starts off with us trying to understand the type of person McAvoy is. He’s kind of a jerk, but a smart and maybe a little bit sad one. And Jeff Daniels plays it all so well. Despite the sarcasm and dismissals, Daniels plays McAvoy with a certain charisma. You really get to see that in his scenes with Skinner and MacHale, in particular. As mentioned, Skinner is funnily portrayed by Sam Waterston. After so many years of watching him be serious on Law & Order, it was delight seeing Waterston playing fun and drunk news corp boss. As for Mortimer, she brings so much charm to her already charming and funny character. In addition, we get to see what’s going on with the news staff, some of them new and some who managed to stay loyal to the tyrannical McAvoy. His assistant is Maggie (Alison Pill), eager to prove that she deserves to be part of the team. She’s not-so-secretly dating McAvoy’s former producer, Don (Thomas Sadowski). MacHale brings in her associate producer, Jim, who is played by John Gallagher Jr. Jim loves the news and is very intuitive when it comes to his job. He’s almost the opposite of Don. Plus, he’s adorable. Dev Patel also stars as another news staff member, Neal. Once we get a handle on the characters, the news happens. This is when we get more of a behind-the-scenes look at what goes on in an almost typical cable newsroom. It’s exciting and interesting. It totally helped that the show takes place two years ago and reports on real life news events. It added a cool dramatic irony. Since you know what happens, it’s interesting to see the characters figure it out. (Also, look out for an unconventional cameo from Jesse Eisenberg). The show ends on a perfect note. It definitely left me longing for more. I’m completely invested in all of these characters and their stories. The Newsroom has the right amounts of drama and comedy. It’s informative, but not overly so. It’s smart, fun and exciting. With a hell of a series premiere like that, I can’t wait for what the rest of the season brings. 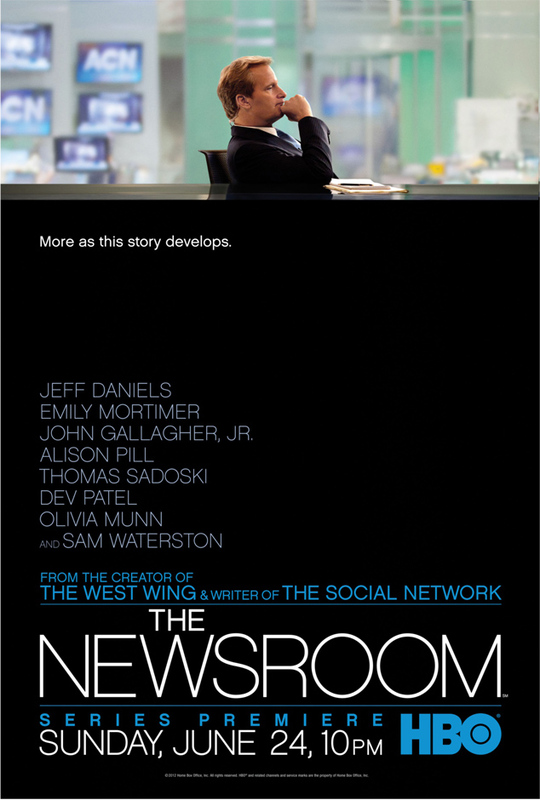 The Newsroom premieres on Sunday, June 24th at 10pm/9c on HBO.